As Rhymes With Geek’s Kyle Overkill had a review of Nailbiter #1 up this week, I’ll link you to that for his views on it here. Now after I read it I’m not going to do as much of a review of the piece as more of my own perspective of writer Josh Williamson and artist Mike Henderson’s new comic from Image Comics. The lowdown of Nailbiter is simple, Nailbiter is in reference to Edward “Nailbiter” Warren who’s a serial killer from the town of Buckaroo, Oregon, which has been home to 15 other serial killers over the years. Now NSA Agent Finch is entering the town after his friend Carroll calls him about something he’s discovered, and Finch is drawn into an even bigger mystery. That’s the story summed up without spoiling anything, As for what I personally think about Nailbiter’s debut issue, I loved it so much it is unreal. Oddly enough as someone who doesn’t watch a ton of horror movies, I read a lot of horror comics. That makes me laugh as my reading tastes are in a billion directions, horror is just one genre that I find myself checking out. The fact that Josh Williamson is a writer I dig reading anyway is a bonus on Nailbiter. I love Williamson’s sense of building the story and the town of Buckaroo, Oregon bringing this all to feeling like I’m part of this place. Mike Henderson’s art helps in creating this setting, the first introduction to Edward “Nailbiter” Warren is unforgettable and will haunt me in the best way possible. The way the characters are drawn fit the personalities that Williamson breathes into them. Finch looks like a legit tough son of a gun but you can tell he’s been through a lot of crap just in how he’s drawn. It’s that level of detail that I appreciate in reading a comic and helps to immerse me into the world. I like how Williamson in one issue manages to set the hook of Nailbiter fast. By the time you get to that last page you at least have an early understanding of where each of these characters come from. I would say the way Williamson paces this with Henderson is a horror/crime drama. There’s even these moments of humor that can’t help but make me laugh. In such an unusual situation that Finch is entering into and meeting the townspeople, you get that Buckaroo is a strange place and they’re all adapted to it. Williamson gives the writing to the characters and the world and Henderson gives the life and building blocks to the rest of Williamson’s vision. Though that’s far from all that amazed me from Nailbiter, far from it. Another factor into my immersion into Nailbiter is Adam Guzowski’s coloring, oh my goodness this is great. The beginning segment came to life in an array of orange hues and then muted darkness with the slightest touches of light, oh man intense and creepy all at once. As Nailbiter settles down, you see Guzman’s color sensibilities even more at work especially as you see Carroll and him standing in a graveyard, capturing the somber and worn atmosphere of where he’s at. As Finch enters the town you see the rain coming down with the neon lights being the only major illumination, it’s gorgeous. The Murder Store is one of my favorite sequences in capturing the mood. Finch wandering around this place with little flecks of light as he explores this twisted store, building up until you meet the jovial Raleigh for the first time. It’s all gravy from there and sets up the atmosphere for the rest of Nailbiter. Henderson and Guzowski work well together in bringing Williamson’s Nailbiter vision to fruition. Williamson is so good with his storytelling in general on this, I’ve been a fan of the guy since Xenoholics and Nailbiter I feel is a big evolution for his writing, it is unlike anything I have read of his before. The next issue will be mine and I await seeing just what twists and turns are in store for me on this series. This is the kind of book where everyone works together seamlessly that you can’t help but be enthralled. That’s how I feel about Nailbiter right now, it’s got genuine scares and a great story in the making. If there’s any copies left at your local comic store or get it at whatever fine digital comic site you buy from, either way buy Nailbiter. I implore you not to miss this comic, I imagine it’s only going to get better from here. As near the end of any given week, time for a good old Rhymes With Geek roundup of what I’ve been up to there. A lot of fun stuff, a lot of cool things, and it is all nifty. Look at these roundups as a way of me giving you bonus material as I process out my thoughts after the review. Enjoy. Just posted up today on May 8, 2014 is my review of New 52: Futures End #1, which you can check out here to learn my further thoughts on that one. If you’re curious I’m likely going to check out the first month. Futures End intrigues me just enough that the first month might be worth it. I call this week my toughest two reviews to write, yes this is in the week following my most brutal review on the planet in Uncanny Avengers Annual #1. Of course considering the second review I did this week, while Futures End was a positive one, at least mostly, this one was a bit tougher to handle than I imagined. The second review was Burn The Orphanage: Reign of Terror #1, and that you can see here as well. I’ve been processing that one, I think in my eyes that the Born to Lose trilogy in Burn The Orphanage was so strong that the monthly series had more to live up to. As this is a five issue series I am going to try out the next issue, confirmation from me on that one. Any kind of premise could have the potential to grow on me. I really want to like this though which is why I’m giving it another go. I still like the core concept so at least Burn The Orphanage hasn’t turned me off completely. As for the final bit of Rhymes With Geek goodness, a crosspost of my Ant-Man piece from here onto the Rhymes With Geek express. Do read this one too, which if you want to check it again it lies here, and reads smoother too. Give a round of applause to editors by the way, Dante Jordan has been working with my stuff a lot when he can and he makes it sing. He’s a cool dude and I appreciate his chats with me. He’s helped my writing a lot even linking me things to help me out. If you have an editor out there fellow writers, tell them they’re awesome because they are. That is the Rhymes With Geek roundup for this week. Thanks for catching up with my stuff there, I appreciate each and every one of you that reads my stuff. Time to set the scene for you, I was a bigger G.I. Joe fan as a kid than a Transformers one. I liked Transformers but for some reason the G.I. Joe’s resonated with me a bit more. Overtime I got more hooked into Transformers thanks to reruns and Transformers: Beast Wars. Now the licensed comics have been a mixed bag for me, recently I reviewed Transformers: Windblade for Rhymes With Geek and it wasn’t a half bad read. Before all this the idea of Transformers vs. G.I. Joe was one that had been done but not with Tom Scioli involved, which screamed that this would be unlike anything I’ve seen before. Tom Scioli is the man who co-created Godland with Joe Casey, American Barbarian and more, so that sold me on this from the get go. He’s working with John Barber and as I read the back matter for this, I like that there’s a genuine sense of joy they’re getting out of working on Transformers vs. G.I. Joe. As I read the #0 issue, the fun that they share in the back matter shows in every inch of Transformers vs. G.I. Joe. 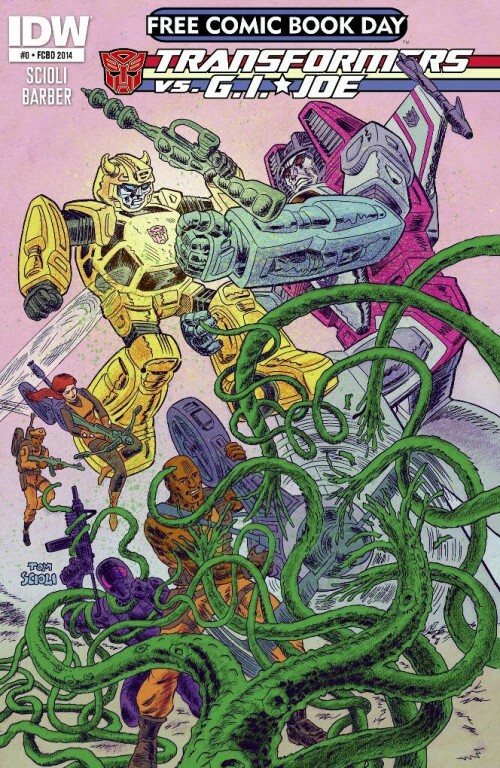 In a way, Transformers vs. G.I. Joe dare I say reminds me of Nextwave: Agents of H.A.T.E. in the sheer joy of this comic. It’s delightful, it’s fun, this is the sort of comic that would have hooked me on Transformers as much as G.I. Joe as a child. The creative way Scioli uses his art to introduce the G.I. Joe team was clever. Each member of the team got introduced via a G.I. Joe file card straight out of the 80’s, that was genius. The entire comic has a retro cool design to it, the added touch of the weathered pages caught my eye. Transformers vs. G.I. Joe feels as if it came from another time but feels perfect for this age, Scioli’s colors, art, and design sensibilities are brilliant. It’s weird that haven’t even mentioning the writing as the art is that jaw dropping, the story is just as much fun. Never seen The Transformers introduced in such a way, they have their own language and that was cool. Great to see Starscream and Bumblebee be the introductions to The Transformers that we get in this comic. The reason why I noted Nextwave in the last paragraph is in the script. The G.I. Joe team is having fun on their mission with a madcap energy that’s straight out of the 80’s but taken to another plane of existence. I felt as if this could be a cartoon now and this would be the hottest show on TV bar none. Now for those who are hesitant about trying out a licensed book, Transformers vs. G.I. Joe could be a nice change of pace. There are comic readers that won’t touch licensed stuff and there are fans of either Transformers or G.I. Joe that won’t read the comics. IDW has a winner here if this goes over the way I think this could. Transformers vs. G.I. Joe #1 is due out in July and I can’t hardly wait to see if the first issue lives up to the FCBD #0 edition. As I’m reviewing Future’s End #1 for Rhymes With Geek, what better time to look over Future’s End #0. The Free Comic Book Day Future’s End #0 is the beginning of this new weekly series showing the New 52 DCU five years later. It is a weird book and starting out thirty five years later in the New 52 DCU is a sight to behold. The story goes is that Brother Eye is in full command and the holy s-word has hit the fan. We get to see the DCU at the worst point possible and why Batman Beyond (Terry McGinnis) is going to play the role he’s going to play. Before we get to Terry McGinnis and Batman Beyond we get an immense amount of weird DCU mania just thrown at us. In this intro Brian Azzarello, Jeff Lemire, Dan Jurgens, and Keith Giffen embrace madness alley and we are along for the ride. If I were to say much of anything right now as to the quality, it’s got me curious. Future’s End piqued my interest without any doubt. We have Batman Beyond five years in the future, again I don’t consider that a big spoiler because it was revealed in the preview pages for Future’s End #1. If I were to spoil Future’s End, it was spoiled by Bleeding Cool and many other venues but I won’t go to that point here. There’s really nothing to spoil though in Future’s End #0, lots of horrible stuff is happening and now Batman Beyond is five years into the future to prevent that. From what Future’s End is showing, nothing is that simple but this looks like it could be fun as to how dark the future is. In a weird way these weeklies DC is doing may be a great way to bring a bit of energy back to the DC Universe. Energy that DC Comics has been lacking for a long time. Strange to say but true, DC Comics coming out of Forever Evil is showing some life. Now don’t take this as me being all flailing arms like Kermit the Frog, I’m cautiously optimistic if anything. Future’s End has ideas and they could be cool ones, Future’s End #1 coming out this Wednesday will give me a further idea as to how this will go. If you’re wondering another reason why I chose to do Future’s End as my review this week is simple; I like Batman Beyond and time travel stories. I’m a sucker for a good future shock story and time travel in general is a selling point for me, you got me for at least the first couple issues DC Comics. Keep an eye out Thursday on Rhymes With Geek for my further thoughts on Future’s End #1, will I love it, will I hate it? At this point I’m at least interested and a free comic isn’t a bad way to get into the door. Let’s see if I want to visit Future’s End on a weekly basis after Thursday. Sit down a spell, Wesley got a story for you all. On Rhymes With Geek I elected to review Uncanny Avengers Annual #1, I thought it would be fun. Now I highly recommend you read the review on the site before going forward. Click here, read on and you’ll get a full sense as to what I went through with the Uncanny Avengers Annual. Here’s a simple fact about me as a reviewer; I don’t score a comic low lightly. If I’m scoring a comic low that means ultimately the comic left me empty and wasted my time. Like most reviewers I enjoy comics, I like talking about them and enjoy looking over a book to find what I like or dislike about a book. After all reviews are opinion so why hold back if you like or dislike something? Love it or hate it with all your might no matter what your opinion may be. In reviewing the Uncanny Avengers Annual, I was not a happy camper. Any poor soul who caught me online during the period I was reviewing this comic got to hear me rant, a lot. In a way I was processing what to say about this comic, free thought ranting was the only way to get through it. Uncanny Avengers Annual #1 was one of the worst comics I have ever read. As I said in the review, there are people who I’ve read reviews of this book who liked this. In my final edits of the review late last night I found reviews raving and just as angry as I was about this comic. I would say my rage was more primal in wanting to tell people to not waste their money on this comic. Editing through that review was one of the harder things to do because it is harder to write a bad review than a good one. My perspective on the good review being easier to write is that I’m excited, I’m happy, I cannot wait to tell to world to buy this comic. Even if I have some small problems with the comic or whatever it is I’m reviewing, it’s still worth your time to check this comic, book, tv show, or some such I’d review. Now for a bad one, in my mind I’m trying to find the words to say in a professional manner, this comic is not for me. My dear friends that were online during my review of the annual got to hear my unfiltered thoughts. Yes to some of you out there when you read this review you may want to buy the annual, it’s intriguing to buy a book that infuriated and annoyed while enchanting other reviewers. Even my review only scratches the surface of how bad this Uncanny Avengers Annual is. Uncanny Avengers Annual #1 is one of those comics hit me at my core of what infuriates me about comics, a pointless and worthless story. That’s why it nearly broke me, that’s why it left me angry, and that’s why I will not be reading Uncanny Avengers for a long time. One comic is all it took to swear me off of Uncanny Avengers. This is my personal blog so I can be a bit more blunt here. The best way to finish this off is simply, Uncanny Avengers Annual #1 was a tidal wave of bad and if it did a number on me, imagine what it’ll do to you. Today is my Rhymes With Geek round up day, as it’s been one active day for me in the Rhymes with Geek Universe. Two major postings, one review and one cross posted feature. Which means it is time to make Rhymes with Geek magic happen as I update you on my activities in Rhymes With Geek for April 29, 2014. Today I cross posted the Justice League Movie article I did here for Rhymes With Geek. Check it out here, with added editorial commentary from Dante Jordan in the mix! Happy to cross post that article from this site and it transferred over well. The only differences in the post from here to Rhymes with Geek are editorial and I added a cool Bruce Timm Justice League picture. Bruce Timm Justice League is amazing, no one can deny this unless you’re a troll. It’s cool to get the article out there a bit more, feel free to read it again as Dante added some cool commentary. It was an enjoyable article to write either way and Dante’s added insight makes it that much more of a fun read. Enjoyed seeing the article from my original content and seeing his view put in there was a blast for me to see. As for my second piece of material, I reviewed Rai #1 from Valiant Entertainment. Feel free to check this review of magic and wonder right here. Just so I don’t repeat my review, please do read it as I had so much fun reviewing this comic. When read feel free to either leave me a comment here or on the review itself on Rhymes With Geek and tell me what you think. Either way, I’m happy for any and all feedback you give me. I hope you all enjoy the review. That’s it for the Rhymes With Geek Roundup for now. Just a nice way so you can know what I’m up to on my main gig in the Rhymes With Geek Universe. This was a larger than average day there so I wanted to make special note of it. On Thursday I have Uncanny Avengers Annual #1 planned for reviewing so don’t miss out! Bye for now.